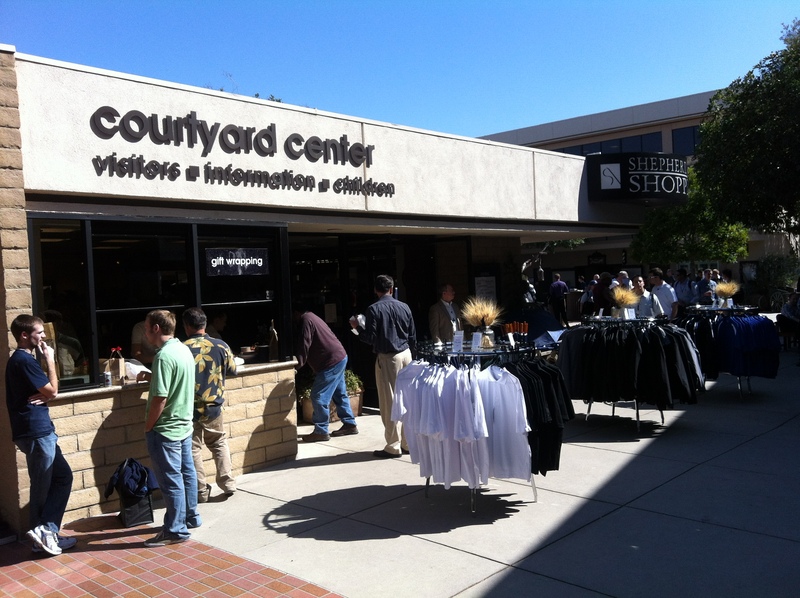 For many, the Shepherds’ Conference, which is hosted by Grace Community Church is the premier event for all pastors and church ministry leaders. Men from all over the United States and the world travel to Sun Valley, California each March to spend three days being taught, encouraged, refreshed, enlivened and invigorated by some of the foremost evangelical preachers of our time. It is not every week, you can sit under the preaching of men such as Dr. John MacArthur, Dr. Steve Lawson and Dr. R. Albert Mohler under the same roof and in the same day. But at the Shepherds’ Conference, you can. As a student at The Master’s Seminary (which is based on the campus of Grace Community Church), we don’t have any classes during the week, but we are required to attend much of the conference. It is the highlight of the year for most students and I can assure you, it is hardly a chore to attend. Even though Shepherds’ Conference week is considered a week of catching up on classes or papers, most students forego the catchup to soak in the atmosphere, meet new people and revel in the teaching from the pulpit. And there is a lot of teaching, from early morning to late evening, there is session after session. It is like drinking from a fire hose. As is customary at every Shepherds’ Conference, the entire student body of The Master’s Seminary opens the first session by singing two hymns. This is the first time that I have been involved in any sort of choir and I found the occasion thrilling. For the week leading up to the conference, we rehearsed for the event and were led carefully through the hymns by Clayton Erb who was very patient and gracious as he taught us. 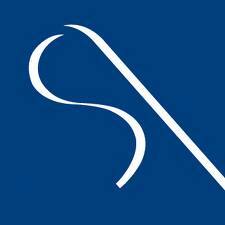 I managed to end up in the bass section of the choir which suited me perfectly as I knew I couldn’t match those tenors. Boy, some of those guys can go really high. Once our duties were done opening the first session, we were free to find seats somewhere to hear Dr. John MacArthur preach the first of the three general sessions that day. 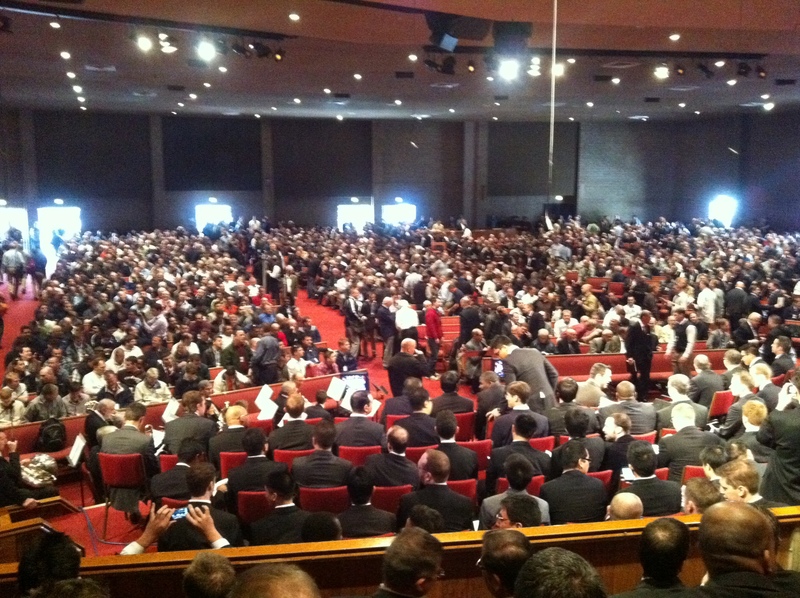 Apparently at this years conference, they was a record number of attendees – somewhere in excess of 3500 men. Wow! As a result, there were other buildings set up as an ‘overflow’ with a large screen, so you could catch each general session if you couldn’t find a seat in the main sanctuary. 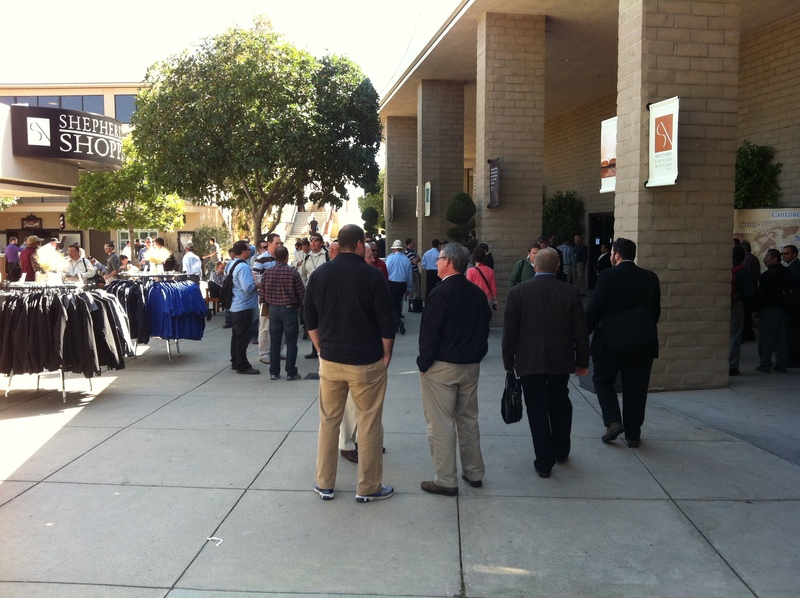 Over the three days, there was three general sessions each day preached by one of the six keynote speakers, and in between, there were break-out sessions held all over the campus where you could sit and listen to your favorite preacher or hear a topic or issue that you were particularly interested in. Throughout the day, a wide range of beverages, food, snacks and other refreshments were available and served to you by one of the very friendly helpers from Grace Church. If you wish, you could get your shoes shined, get a haircut or spend the fifty dollar gift voucher at one of the bookstores or the Shepherds’ Shoppe or even ask one of the TMS faculty manning the Scholars Desk a very challenging question. 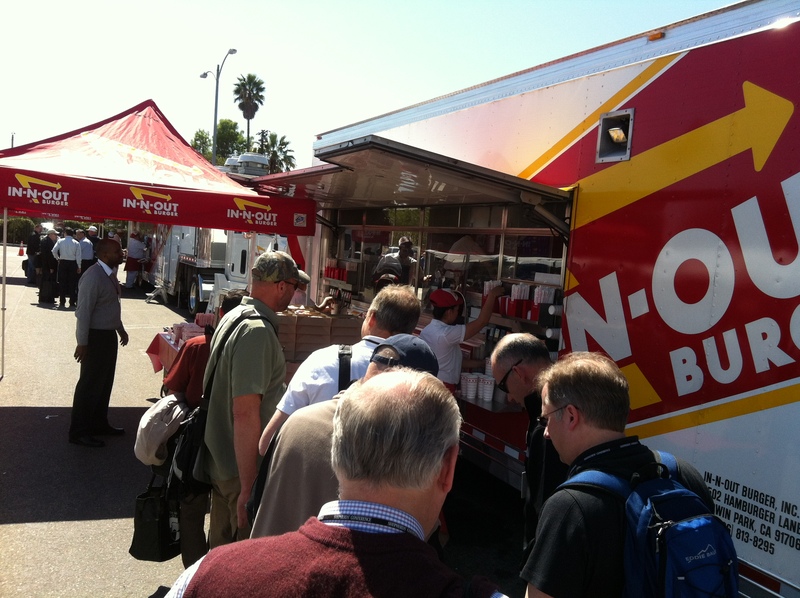 All three main meals were served and I was especially pleased to enjoy on of my favorites, IN-N-Out Burger for lunch on Day Two. 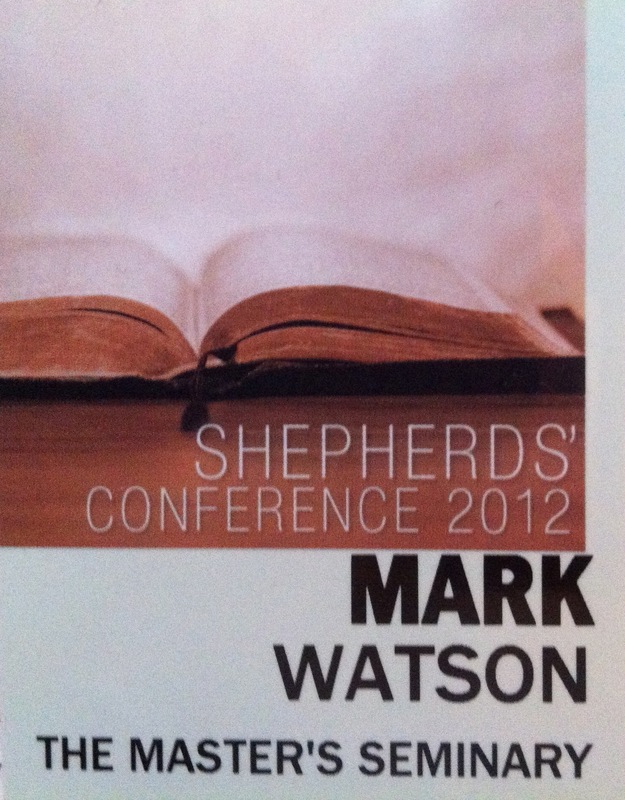 The Shepherds’ Conference, for me was a great experience. I listened to some great preaching, met men from all over the world and was given no less than nineteen free books and resources as well as the books that I bought with my gift voucher. I am grateful to The Master’s Seminary and Grace Community Church for their wonderful generosity and servanthood over the past three days. But, I am especially thankful to God, that despite my constant failure to obey Him fully, He is so gracious and good in that He has given me the privilege of attending this event and given my family the experience of a lifetime over the next few years. “For great is the LORD and greatly to be praised”: Psalm 48:1a. This entry was posted in Ministry, Seminary. Bookmark the permalink. What was the content of the first session? Did Dr. MacArthur say anything about Mark 16:9-20? Thanks. I listened. Dr. MacArthur made some very misleading and false statements in the course of that presentation.